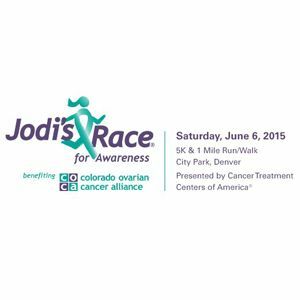 Support Jodi’s Race – ovarian cancer awareness! Saturday, June 6, 2015. This is our 5th year supporting Jodi’s Race and we have met so many strong survivors at this event. Every year, 220 women in Colorado will lose their battle against this deadly disease. Their deaths can be prevented by earlier diagnosis and greater awareness of ovarian cancer symptoms. There is no screening test for ovarian cancer, so being able to recognize these symptoms and being diagnosed early is critical to saving lives.